I’ve always been fascinated by the Romanov family and their downfall from power. Perhaps that’s why Jessica Khoury’s Last of Her Name appealed to me. It gives subtle nods to the Romanov family and Anastasia, who was rumored to have survived execution. The Last of Her Name takes place in the galaxy known as the Belt of Jewels. Sixteen years ago, a rebellion removed the Leonov royal family from power. All were murdered, including the youngest child, Princess Anya. With the Leonov’s gone, the Union government came to power. Stacia spends her days rambling her father’s vineyard with her friends, Clio and Pol. She doesn’t think much about politics until a Union ship appears in the sky. That alone is strange, but when the leader of the Union, the Direktor Eminent himself, arrives and declares there are empire loyalists living in Stacia’s village, things get dangerous. The Direktor claims that Princess Anya Leonova is alive — and Stacia is the lost princess. Before Stacia knows what hits her, Pol smuggles Stacia to a hidden escape ship. Leaving Clio and Stacia’s parents behind, the two head to an unknown destination. It seems everyone has a plan for Stacia, but all Stacia wants is to save her best friend, and she’ll stop at nothing to accomplish her goal. 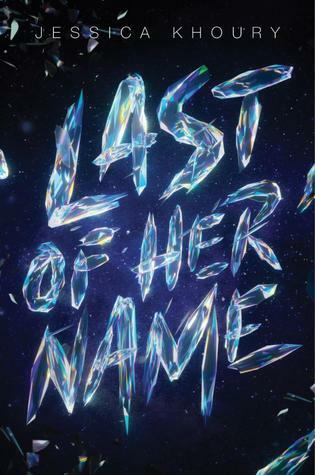 Last of Her Name quickly became one of my favorite books this year. From the beginning, I found myself swept into Khoury’s world. The unknown has an underlying current of familiarity that brings the book to life. It’s like a sci-fi, historical fiction, fantasy mash up that unfolds almost cinematically. Khoury’s pacing is on point. She excels in balancing Stacia’s inner turmoil, her outer struggles and the world building she experiences it all within. Last of Her Name is one novel I plan on rereading more than once.